We don't usually talk about Black Friday four months before it takes place, but Samsung is (indirectly) making us do it now. The company just unveiled what it calls an "Early Black Friday" deal involving its Galaxy Tab S3 Android tablet. From July 26 to July 28, the Samsung Galaxy Tab S3 will be sold for $449.99 ($100 off the regular price) while also coming with a free pair of AKG On-Ear Bluetooth Headphones (normally $180). Meanwhile, as of today, you can already get free AKG headphones with the Galaxy Tab S3, but the slate currently costs $549.99. If you don't desperately need a Tab S3 before July 26, it's certainly worth waiting to buy it then for just $449. 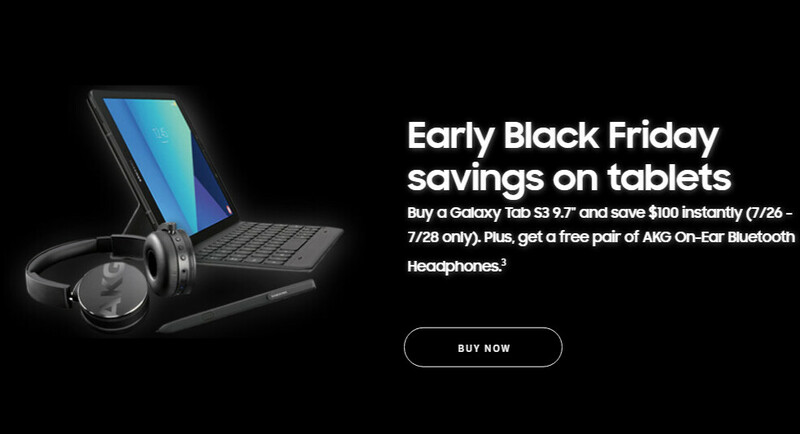 This Early Black Friday 2018 deal will be available exclusively on Samsung's US website via the source link below. As you may know, the Samsung Galaxy Tab S3 comes with an S Pen stylus in the box, but its keyboard cover (pictured above) is optional and you have to pay extra if you need it. A new and improved Galaxy Tab S4 is expected to be announced in August, so it makes sense for Samsung to try to clear its Tab S3 inventory. Do you think you'll want to get a Tab S3 during Samsung's super-early Black Friday sale, or would you rather wait to see what the Tab S4 has to offer? I should have waited for this offer. You mean "dump the inverntory" day.